[Fig. 6] Skidaway Island, an interior barrier island fronted by Wassaw Island, is home to Skidaway Island State Park, the world-renowned Skidaway Institute of Oceanography and the University of Georgia's Marine Extension Center, and the largest coastal residential development in the Savannah area called The Landings. Though extensively developed by the Union Camp Corporation, the island today has one of the best state parks in Georgia, with two breathtakingly beautiful nature trails and a full complement of facilities. The Marine Extension Center has the best aquariums in the Savannah area and an excellent nature trail that follows Skidaway Narrows. The 6,300-acre Pleistocene island is defined by the Wilmington River to the north, Skidaway Narrows to the west, the Vernon River to the south, and Romerly Marsh and Wassaw Island to the east. High ground on the island is roughly 8 miles long by 3 miles wide. Skidaway has had many different spellings throughout history. Some believe Oglethorpe named Skidaway in honor of his Indian friend Tomochichi's wife, who was called Scenawki. Older than Wassaw, Skidaway is one link in Georgia's Pleistocene barrier island chain that would have been oceanfront property at some stage approximately 40,000 years ago during the last Ice Age. With the melting of the glacial ice and the rise in sea level, Skidaway's younger sister Wassaw came into being approximately 5,000 years ago. The older, Pleistocene islands like Skidaway tend to be flatter with well-developed soils, whereas the younger, Holocene islands like Wassaw have many dune ridges and poor soils. Skidaway, with its rich marsh filled with oysters, mussels, clams, and whelks, had long been a hunting and ceremonial ground for Timucua Indians that lived in the area. Archaeologists have found 56 sites on the island with evidence that Indians used the island at least 4,000 years before General Oglethorpe sailed up the Savannah River. Three ceremonial shell rings, dating back to 1750 b.c., have been found on the island. These rings are a type of New World pyramid and fewer than 20 of them have been discovered, all in the southeastern United States except for one in Ecuador. The shell rings are perfectly symmetrical and uniform in height and thickness of wall. The interior centers of the rings were kept very clean and any debris found in them were left behind by later groups. The Timucua were targets of mission activities by the Spanish in the 1630s, and became extinct by the 1760s from European plagues and English-sponsored slaving. Paleontologists have also found on the island the fossils of Georgia's megafauna, such as mastodons, mammoths, giant sloths, and native horses, which became extinct five to ten thousand years ago for reasons unclear today. Oglethorpe assigned five families and six single men to Skidaway Island, and they built a small fort at the northern end of the island (later a fort would be built at the southern end of the island as well). The fort commanded the river, with one carriage gun and four swivel guns. Methodist founder John Wesley visited the area in 1736. Despite attempts to gain a foothold, by 1740, the island was abandoned when the pioneers were unsuccessful in farming the infertile soil. The next period of settlement was from 1754 to 1771, when 29 grants of land on Skidaway were issued to settlers who were to be more successful. An early grantee was John Milledge, who established the plantation Modena, which is believed to be named for the Italian town that was the seat of the silk culture, an early industry on the Georgia coast. His son, John Jr., became a U.S. representative and senator, governor of Georgia, and founder of the University of Georgia, then called Franklin College. Modena Plantation survived until the mid-1800s, and today is the site of the Skidaway Institute of Oceanography and University of Georgia's Marine Extension Center. The Roebling family, whose great great grandfather engineered and built the Brooklyn Bridge, was one of the last owners of property. Locals still call the area Modena. During the Revolutionary War, Skidaway saw a small skirmish when Patriots attacked and drove off a forage party of British Marines. Between the War for Independence and the Civil War, the area saw relative prosperity, with approximately 2,000 inhabitants and plantations producing cotton, indigo, corn, cattle, and hogs. During the Civil War, earthen batteries were established on the island to defend the southerners from northern attacks and the 4th Georgia Battery was posted here. (A battery can be toured on the Big Ferry Interpretive Trail at Skidaway Island State Park). With the success of the Union blockade in 1862, Skidaway was abandoned, and when the South lost the war and slavery was abolished, the plantations fell into ruin. Black freedmen were the next to try their luck on Skidaway. These former slaves were assisted by the Freedman's Bureau and Benedictine monks, the latter who established a monastery and school for black children near Priest's Landing on the eastern side of the island. (Priest's Landing is located at the end of Osca Road off of McWhorter Road.) A tidal wave in 1889 ruined the freshwater supply and farming failed from infertile soil and Skidaway was abandoned again. During Prohibition of the early 1900s, Skidaway became a prime bootlegging site because of its isolation. An abandoned still from this era is founded at Skidaway State Park on the Big Ferry Interpretive Trail. In the war-torn, defeated rebel states, southerners had only their property and natural resources to climb out of poverty. The industrialized North had the financial and political advantage over its impoverished southern neighbors and used it across the South. Skidaway was no exception, and various northern interests gained control of the island in the late nineteenth and early twentieth centuries. The largest of these, Union Camp (then called Union Bag and Paper Corporation) consolidated its holdings and used Skidaway for pulpwood production in the 1940s. By 1964, Union Camp had designs to develop residential property on the island, but Skidaway lacked a bridge that would provide easy access for cars. Union Camp offered to donate 500 acres to the state if Georgia would build a bridge to the island. Nothing came of this offer until 1967, when Union Camp donated 500 acres that became the site of Skidaway Island State Park. The bridge was built in 1971, and Union Camp subsequently developed the gated, residential golf community called The Landings, which today features six 18-hole golf courses. [Fig. 6(5)] This state park has it all, including a swimming pool. But more important are the natural communities that grace the 533-acre tract, best viewed by hiking or biking the 1-mile Sandpiper Nature Trail or the 3-mile Big Ferry Interpretive Trail. The park, along with the 500 acres that the University of Georgia's Marine Institute of Oceanography sits on, was given to the state by Union Camp Corporation, which owned much of the island and wanted a bridge built to the island so it could develop The Landings. The property was transferred in 1967, the bridge was built in 1971, and Skidaway Island State Park was officially opened in 1975. Today, it is one of the finest parks in the state system. The park is on the Colonial Coast Birding Trail established by the Georgia Department of Natural Resources. The park borders Skidaway Narrows, which once was a narrow, shallow tidal creek. In 1905, the U.S. Army Corps of Engineers first dredged the channel and eventually made it part of the Atlantic Intracoastal Waterway. 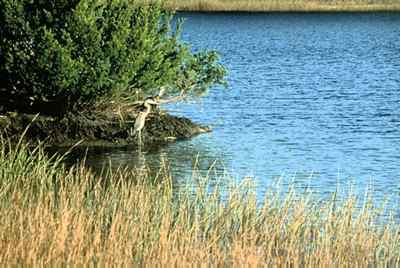 The park consists of maritime forests, tidal creeks, freshwater sloughs, and salt marsh. Trees you will find here are old Live Oaks with tremendous growths of Spanish moss, cabbage palms, longleaf pines, magnolias, red bays, and other species. The salt marshes consist of Spartina species and needlerush, with fiddler crabs and marsh snails in abundance. The park has 88 pull-through campsites with water and electrical hookups. Elevated tent pads with grills and tables are also provided. Picnickers have the choice of five covered shelters on 10 acres. Two restrooms are located here along with playgrounds for children. A group shelter is available for rent, with a capacity of 150 people. It comes with a range, refrigerator, bathrooms, grill, and tables and chairs. An outside oyster-cooking shed is available to rent. A public boat ramp is found on the south side of the Diamond Causeway bridge where it crosses Skidaway Narrows before you reach the park. Directions: Located 6 miles southeast of Savannah on the Diamond Causeway on Skidaway Island. Exit from I-95 at Exit 16/94. Drive 12 miles toward Savannah. Turn right onto Montgomery Cross Road and proceed 1.4 miles to Whitfield Avenue. Turn right onto Whitfield Avenue. This becomes Diamond Causeway. Proceed 5 miles to entrance of the park. Activities: Nature hiking, biking, camping (primitive, intermediate, recreational vehicle), interpretive programs, swimming, picnicking, historic touring. Facilities: Museum, bookstore, bathrooms, hiking trails, handicapped-accessible facilities, boat ramp, picnic area. Dates: Open 7 days a week 710. Fees: $2 parking fee. Additional fees for camping. For more information: Skidaway Island State Park, 52 Diamond Causeway, Savannah, GA 31411-1102. Phone (912) 598-2300. Reservations phone (800) 864-(912) 7275. Two trails are featured at Skidaway: the 1-mile Sandpiper Nature Trail and the 3-mile Big Ferry Nature Trail. The Sandpiper Nature Trail is for hiking and viewing the marsh ecosystem; the Big Ferry Nature Trail is for learning about maritime forest and Skidaway's human history. The Sandpiper Nature Trail is easily hiked, with a boardwalk that extends out into the marsh. Here during low tide you will see countless fiddler crabs, looking from above like a miniature herd of wildebeests, stampeding through the marsh and salt pan. At least four kinds of small land-preferring crabs are easily found in marsh: sand fiddlers or red-backed crabs (Uca pugilator), mud fiddlers or blue fiddlers (Uca pugnax), brown square-backed crabs (Sesarma cinereum), and purple square-backed crabs (Sesarma reticulatum). Square-backed crabs are also known as wharf crabs. Fiddler crabs are recognized by their one large claw. This claw is used by the male in defense and attracting a mate. Females lack the large claw. The sand fiddler, as its name suggests, prefers sandy habitat or flats near the marsh where it can strain out bits of food from the detritus. The sand fiddler is identified by its whiter carapace (the mud fiddler carapace is brown) with conspicuous pink and purple patches. Mud fiddlers prefer muddy marshy habitat. Neither lives in the tall streamside marsh grass area: This is the preferred habitat of the square-backed crabs. These crabs are perhaps the most numerous creatures in the marsh and are an important link in the coastal food chain, consuming diatoms, algae, and decaying Spartina and becoming themselves food for higher level animals such as birds, fish, and mammals. The Sandpiper Nature Trail is a good place to see wading birds in the marsh, such as herons and egrets. The shy clapper rail or marsh hen is also found here. Osprey, or "fish hawks," are often seen cruising the waterway looking for prey. Confederate earthwork fortifications are a feature of the trail. Trail: The 1-mile trail begins and ends near the swimming pool and Visitor Center Park Office. The first part of the trail is the Big Ferry Causeway, which once served as the main road on the island. Where the road terminates at the northern end of the island was the location of a ferry that carried passengers across Skidaway Narrows to Savannah. Man-made freshwater ditches or sloughs on both sides of the road support freshwater vegetation and are an important fresh water source for wildlife on the island. Alligators are frequently found in the slough. The trail leaves the causeway and crosses a natural freshwater slough. Here you may witness wading birds or hear the splash of shy frogs. As you hike on, notice how the forest changes from older pine to live oak and red cedar. Woodpeckers are found in the pine forest, utilizing the old snags that park managers have left to succumb to natural causes. These old, decaying trees are important feeding and nesting sites for a variety of woodpeckers and other birds, and as the tree dies and falls to the ground, it helps enrich the soil. Found near the trail is the state flower, the Cherokee rose (Rosa laevigata), which is not a native species but nonetheless has managed to become established here. Magnolia and sweetgum are also found in the forest, adding to its diversity. Growing out of the sandy soil is a live oak forest with many stately, beautiful trees draped with Spanish moss. The emerald green resurrection fern (Polypodium polypodioides) grows on the trunks and branches of Live Oaks as well. When the weather is extremely dry, the fern's leaves dry and curl up. After a rain, the ferns earn their name by coming alive with color. The understory is classic maritime forest, with saw palmettos indicating high and dry ground. 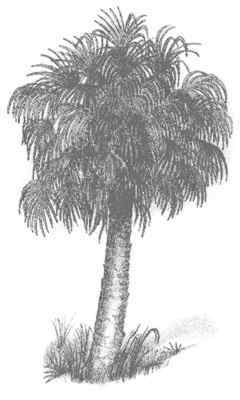 The saw palmetto (Serenoa repens) gets its name from its toothed stem. White-tailed deer are a frequent sight on the trail. Farther along the trail, hikers come to the remains of a liquor still. Moonshining was a popular and lucrative activity on the island in the 1910s and 1920s. Operators could easily hide their activities and transport their product to boats hidden in the marsh. Moonshiners would take corn or grain, ferment it, and then heat it up in a boiler, causing alcohol to be vaporized out and into the coils of the receiver. According to park records, moonshining continued in the area up until the 1970s and approximately 30 former still sites are known in the park. A short distance from the still hikers find shell middensor depositsleft by Indians who hunted and lived on the island. Harvested with relative ease, the oysters, mussels, crabs, and fish of the marsh provided important sustenance to the Indians. The middens are frequently recognized by the cedar trees found growing on top of them. Cedars like the limey soil created by decaying oyster shells. At the farthest point on the trail are the earthworks of a Civil War fort believed to be built by slaves. To the right is a mortar battery. The fort was abandoned in March 1862 when officers determined that it was too isolated and incapable of resisting a Union assault. Returning, hikers are refreshed by views of the salt flats, salt marsh, and Skidaway Narrows. An observation platform gives hikers views of the entire area. Hikers return to the trailhead by the old causeway. [Fig. 6(6)] This site on Skidaway consists of two parts: the open-to-the-public University of Georgia Marine Extension Center and the open-to-the-public-with-reservations Skidaway Institute of Oceanography, both of which share a 691-acre campus dedicated to providing an understanding of Georgia's ecologically valuable coast. The Marine Extension Center, located on a bluff overlooking Skidaway Narrows, is open to the public and well worth your time. The best public saltwater aquarium in the state is housed in the center, along with educational exhibits, an educational sales shop, and public restrooms. Outside the building is a nature trail that winds through a maritime forest that overlooks the water. Picnic tables are found here and the public is allowed to stop, eat a lunch, and take in the marsh views. Inside the red brick building, 14 aquariums holding almost 10,000 gallons of brackish water feature species native to the Georgia coast and are a good starting place to learn some of the creatures one may encounter in nearby waters. In fact, most of the fish have been caught in local waterways, many aboard the University of Georgia trawler Bull Dog. Some of the more popular species are a loggerhead turtle, longnose gar, nurse shark, lookdown fish, and spiny lobster. Also on display are many impressive fossils, including mammoths and extinct whales. Shark teeth fascinate impressionable youngsters. The Jay Wolf Nature Trail is approximately 1 mile long if one hikes the long loop and half that length if one takes the short trail. It begins behind the aquarium and follows along the Skidaway River before turning back and finishing at the parking lot. The forest is not a true climax maritime forest, due to the disturbance the land experienced when the area consisted of plantations. Notice barbwire used to fence in cattle and hogs that were raised in the area. However, the trail is marked well and helps the novice learn major floral species, including laurel cherry (Prunus caroliniana), sugarberry (Celtis laevigata), live oak (Quercus virginiana), cabbage palm (Sabal palmetto), laurel oak (Quercus laurifolia), and sweetgum (Liguidambar styraciflua). Other species noted are Spanish bayonet or yucca, red mulberry, beautyberry, muscadine, and saw palmetto. Oyster middens, deposited by Indians who hunted and fished on Skidaway, are also evident. More modern structures built by early colonists are also found on the property. Southern red cedar is an alkaline-loving coastal relative of the Eastern red cedar, so it is found growing where oyster middens are part of the soil. When oyster shells break down, they release lime into the normally acid soil, lowering the pH and creating the necessary chemistry for the red cedar. The Skidaway Institute of Oceanography came into existence in the late 1960s due to a donation of 680 acres of land from Robert Roebling and the strong interest from scientists at the University of Georgia in creating an educational arm to study the natural processes of the coast and ocean. The University of Georgia's Marine Sciences Program was established in 1976 and designated a school in 1992. The Marine Sciences Program is responsible for the coordination and management of the Marine Institute, the Marine Extension Service, the Georgia Sea Grant College Program, and the Department of Marine Sciences. The Marine Institute, located on Sapelo Island, was established in 1953 at the invitation of R.J. Reynolds, the multimillionaire owner of Reynolds Tobacco Company, who owned Sapelo Island from 1933 until his death in 1965. Research on Sapelo has centered mainly on basic marsh ecology, examining the factors regulating the metabolism of the salt marsh ecosystem and providing an understanding of energy flow and cycling of minerals and nutrients though the marshes and nearby ocean. The Marine Extension Service helps to solve problems related to the state's marine resources. The Marine Resources Center on Skidaway is the major marine education facility for schools and colleges in the state. The educational center's facilities include laboratories, touch tanks, a teaching aquarium, a museum, a dormitory, a cafeteria, a library, an audio-visual room, and a distance-learning classroom. The educational staff provides programs for school groups from elementary to college level, as well as adults, teachers, and other groups that have an interest in learning about the coast. Scheduled groups can use one of the University of Georgia's research vessels to tour the marsh, or study on the grounds that serve as an outdoor classroom or laboratory with nearly 700 acres of coastal forest, along with 1,000 acres of salt marsh and 18 acres of freshwater ponds. Visits range from an hour or two to a full-week program for a complete unit on marine science. Programs range from historical studies to trips to Wassaw Island. The programs are popular so reservations must be made well in advance. An additional extension station is found in Brunswick, where specialists monitor and support commercial fishing and seafood processing industries. The Georgia Sea Grant College Program, established in 1971, is part of the National Sea Grant College Program. Sea Grant promotes the wise use of marine resources through a coordinated program of research, education, and advisory services. Because of excellence in these areas, the University of Georgia earned Sea Grant College status in 1980, becoming only the 15th educational institution in the country to attain that rank. Trail: Jay Wolf Nature Trail, 1-mile loop. Directions: Located 6 miles southeast of Savannah on the Diamond Causeway on Skidaway Island. Exit from I-95 at Exit 16/94. Drive 12 miles toward Savannah. Turn right onto Montgomery Cross Road and proceed 1.4 miles to Whitfield Avenue. Turn right onto Whitfield Avenue. This becomes Diamond Causeway. Look for signs to the Skidaway Marine Extension Center. Proceed to McWhorter Drive. Follow McWhorter to the left to the entrance to the aquarium. Activities: Aquarium, exhibits, nature hiking, picnicking, field trips. Special events and programs are scheduled at the Marine Extension Service. Call ahead for details. Facilities: Aquarium, bookstore, bathrooms, hiking trail, handicapped accessible facilities, picnic area. Dates: Open Monday through Friday from 94, Saturday noon5. Closed on major holidays. Fees: There is a small fee to tour the aquarium or attend special educational programs. Nature trail is free. For more information: The University of Georgia, Marine Extension Service, 30 Ocean Science Circle, Savannah, GA 31411. Phone (912) 598-2496.